Best Air Filter for 3.5 Ecoboost Reviews: Top-5 in April 2019! The 3.5 Ecoboost is a Ford engine that was first introduced to the market in 2007 in the “TwinForce” Lincoln MKR concept vehicle. The 3.5L Ecoboost is engineered to provide similar power and torque as the V8 6.0L engines and improving the fuel efficacy by 15% at the same time. This first TwinForce engine delivered 415 hp (309 kW) and 400 lb-ft (542 Nm) of torque, and it used E85 fuel. The name was changed from TwinForce to Ecoboost in 2008 when the Lincoln MKT was introduced using the TwinForce name. In 2009, the Ecoboost started official production. The 3.5L Ecoboost is based on the Duratec 35 V6 engine block, and this model provides high fuel pressures up to 2150 psi through its fuel charging and delivery systems. Two BorgWarner K03 turbochargers are integrated into the F-series EcoBoost 3.5L V6 model, and these can spin up to 170,000 rpm, providing up to 15 psi of boost. The transverse EcoBoost 3.5L V6 comes with two Garrett GT1549L turbochargers set up in a twin-turbo configuration; these deliver up to 11 psi of boost. This engine model consumes 25% more air over standard models and runs on standard fuel. The EcoBoost V6 started to appear in the 2010 Lincoln MKS, then in the 2010 Ford Flex, 2010 Ford Taurus SHO, and 2010 Lincoln MKT. The next generation model of the 3.5 EcoBoost is the 3.5 L Ecoboost model, and it first appeared in the 2017 Ford GT. This model delivers 647 hp (482 kW) and comes paired with a seven-speed semiautomatic transmission. At the same time, Ford presented the 2017 Ford F-150 SVT Raptor; this uses the 3.5 L twin-turbocharged EcoBoost V6, which delivers 450 horsepower in the Raptor outperforming its 6.2-L V8’s 411HP performance. The 2nd Gen 3.5 L EcoBoost is replacing all F-150 engines from 2017 and onwards, and these models now come with the 10R80 10-speed automatic transmission. Among the most important features in the new gen, upgrades are the added port fuel injectors that prevent buildup on the intake valves keeping them clean. Now let’s take a look at the best air filters for the 3.5 and 3.5 L EcoBoost engines. 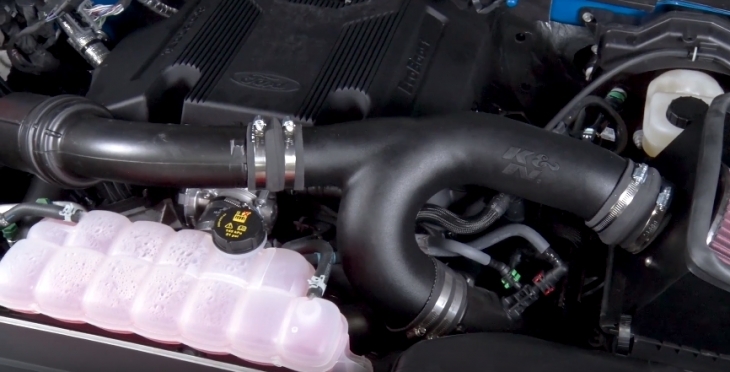 This is the K&N 63-2592 Air Intake for 2105-2016 F-150 3.5 EcoBoost models. 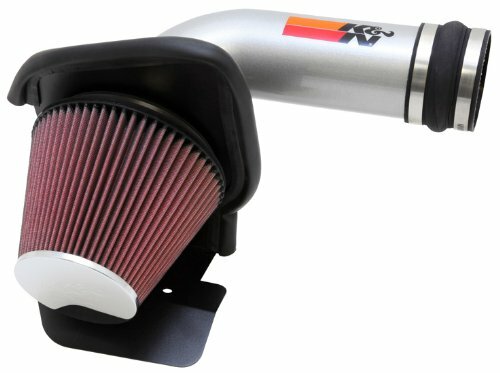 The K&N 63-2592 AirCharger air intake system comes as a full factory replacement kit and delivers exceptional torque and power gains. These models are designed to reduce restricted airflow, thereby improving the air intake into the engine and maintaining a cooler air standard of performance. This model comes with a chromed top, and a heat shield to protect the filter from the engine compartment heat. The black polyethylene tube and box are designed to protect the components from heat as well as maintain a smooth airflow at all times. The tube is constructed to retain the ATS and is designed for a large and free flowing intake from the filter to the engines throttle body. This kit comes with the standard oversize K&N red cotton gauze filter that will last for up to 100,000 miles. This model only takes around 90 minutes to install using two standard hand tools, a screwdriver, and wrench. This is a standard K&N filter kit that delivers improved performance from a stock replacement kit. It fits seamlessly into any 2015-2106 F150 engine compartment. This is the S&B Filters 75-5081 Cold Air Intake for F-150 and F-150 Raptor models 2015-2016. The S&B Filters 75-5081 is specifically designed for the Our cold air intake for the 2015-2016 Ford F-150 and Ford F-150 Raptor 3.5L Ecoboost engines. When applied these kits reduce the restriction on air flow by 43.10%, thereby improving overall engine performance and increased power and torque. This model comes with an all-encompassing box; this means the filter is completely protected from the engine, reducing the effects of engine heat to a minimum. It also makes sure that larger particulates and dirt do not penetrate the air filters integrity. The filter itself is a large 8-layer Cotton Cleanable or Dry Extendable product, and the all-encompassing box comes with a clear view window that enables you to see the status of the filter at all times. The large inlet port assures that cool air is constantly being funneled into the filter, and the large diameter polyethylene tubbing makes easy delivery of the cols clean air to the engine. This is an air filter kit that goes beyond performance; it delivers a very thoughtful protective environment designed to maintain cool air at all times. The additional ergonomic interface makes engine maintenance much easier. 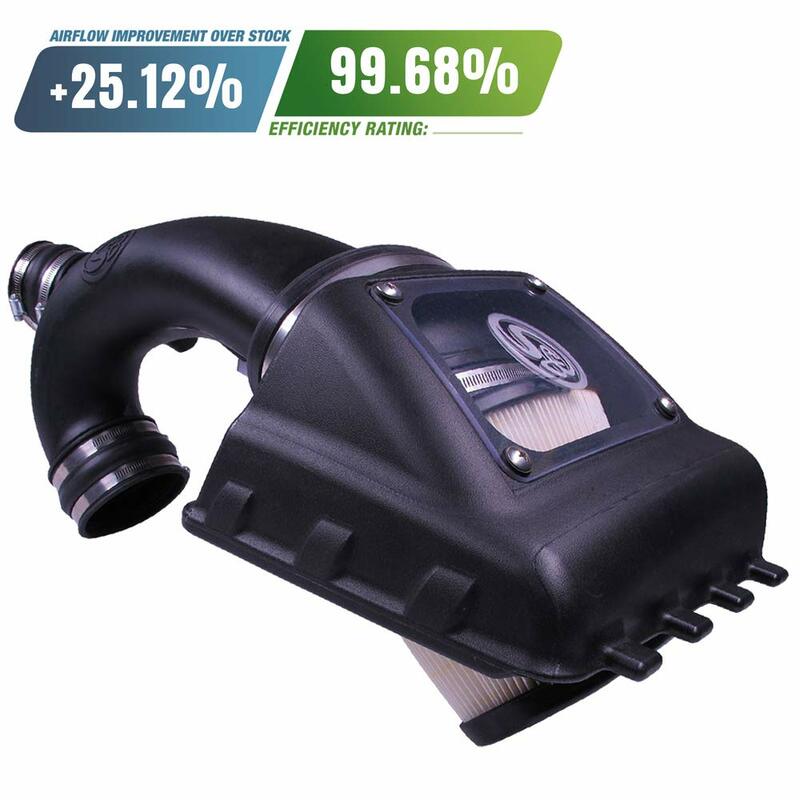 This is the S&B Filters 75-5067D Cold Air Intake for 2011-2014 F-150 3.5 EcoBoost models. The S&B Filters 75-5067D is specifically designed for the Our cold air intake for the 2011-2014 Ford F-150 3.5 Ecoboost engines. After installation this kit reduces the restriction on air flow by 28.33%, this improves overall engine performance and increased power and torque. This model also comes with an all-encompassing box; this means the filter is completely protected from the heat of the engine and reduces in box air temperatures to a minimum. It also makes sure that larger particulates and dirt do not penetrate the air filters integrity. This box comes with a clear view window that lets you see the status of the filter at all times. There is a large inlet port on the underside that maintains a constant flow of cool air into the filter, and the large diameter polyethylene tubbing makes easy delivery of the cols clean air to the engine. The filter itself is also a large 8-layer Cotton Cleanable or Dry Extendable product. This is another exceptional S&B product, and as an air filter kit it also goes beyond performance and delivers a very thoughtful protective environment engineered to maintain cool air at all times. The additional transparent window makes filter maintenance easier. 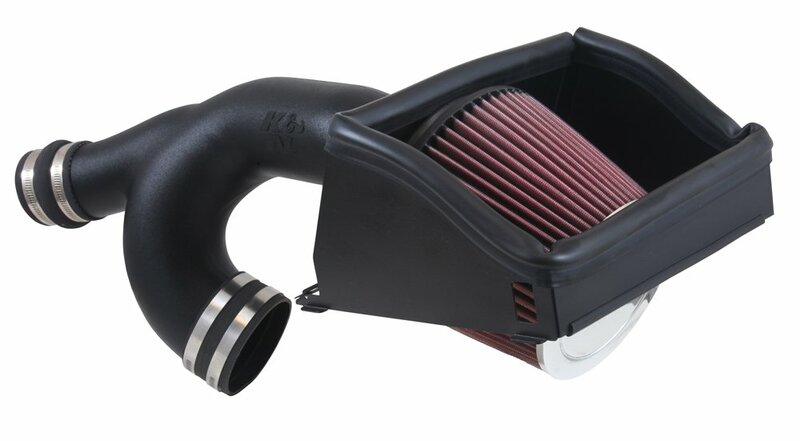 This is the K&N 69-3531TS Air Intake kit for 2011-2019 Ford Taurus, Explorer, Flex with 3.5 and 3.5 L EcoBoost engines. 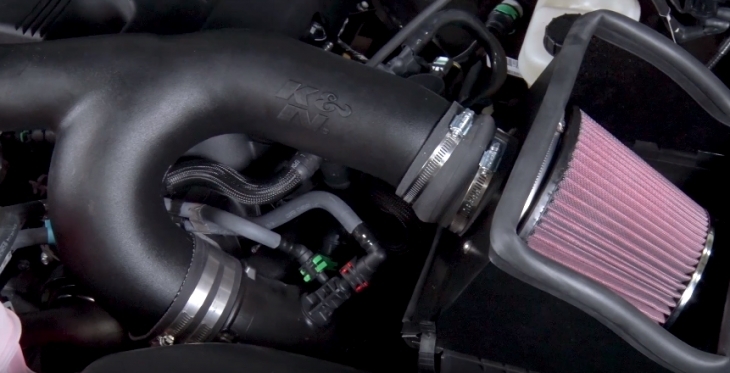 The K&N 69-3531TS Typhoon air intake system comes with a mandrel-bent aluminum tube air induction system. This is a full factory replacement kit and provides your engine with some serious performance upgrade. The overall design includes a cone-shaped filter attached to a mandrel-bent aluminum tube which acts to protect the flow of air from excess engine heat, as well as retain a life of integrity. This is a very strong and reliable replacement. 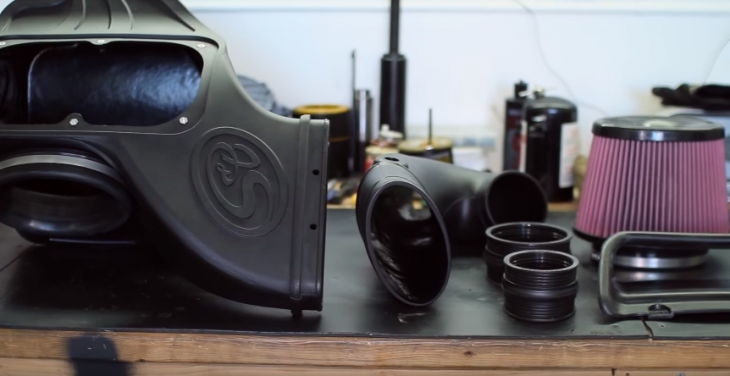 The 69-3531TS air intake has a chrome topped oversized cone shaped K&N high-flow air filter, and the intake tube is silver powder-coat finished. The air filter is expected to last for up to 100,000 miles. As with all K&N models, this comes with all the hardware and is easy to install, usually takes under 90 minutes. With this air filter kit in your engine, you will find driving improves radially, yes, radially, that is how effective this specific kit is for your EcoBoost performance. 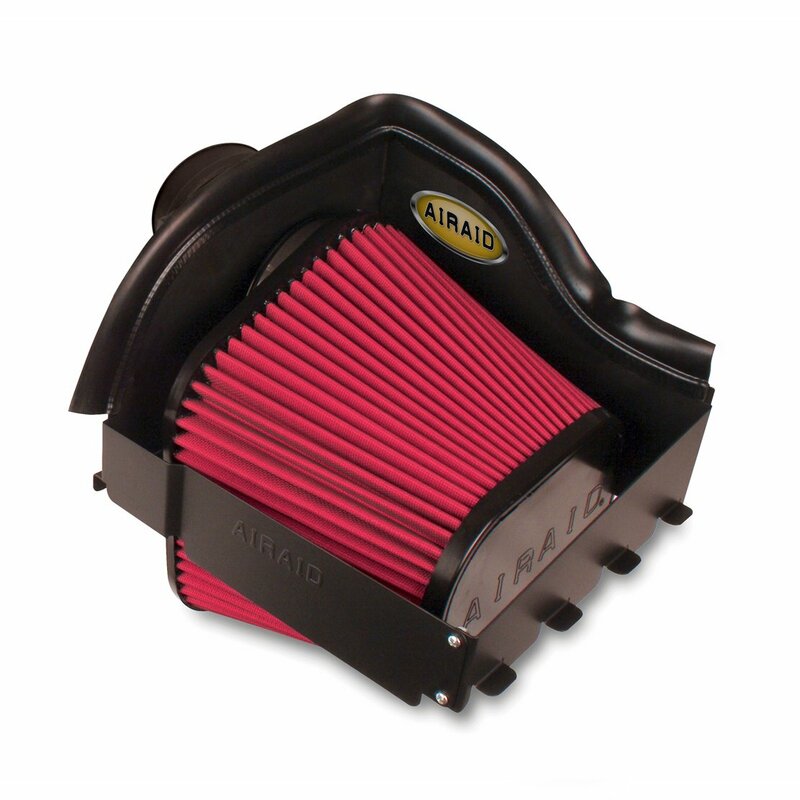 The AIRAID Air Box System model 400-239-1 is an open filter unit that delivers vast air power to your engine. 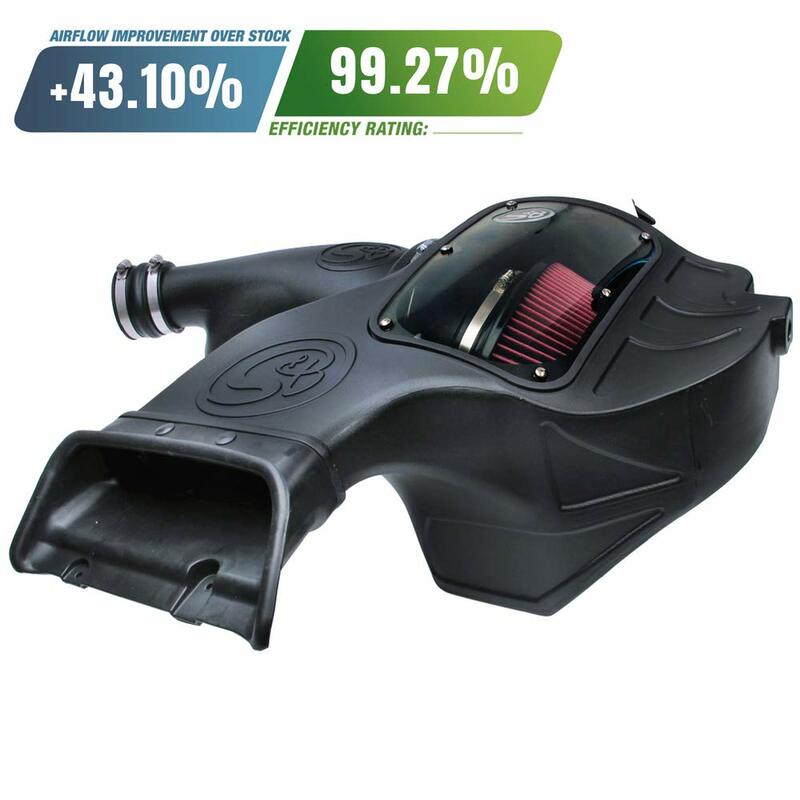 It comes in an isolated black polyethylene frame that is open on all sides but two, and has protective Cold Air Dam panels that provide a steady, free-flowing force of cooler outside air into the filter and onto the engine. This kit fits into the stock airbox location and uses the factory cold air inlet duct. The panels are used to help isolate the filter from excessive engine heat while maintaining a large surface area for maximizing air flow. This model uses either a Cotton Gauze or a Non-woven Synthetic filter unit, the replacement part for this kit is the 720-478 filter. If you are seeking a stage 0 replacement, then this is a great kit for a comprehensive change, it is not a boxed filter, as such it’s a stock replacement that profiles slight improvements over stock. 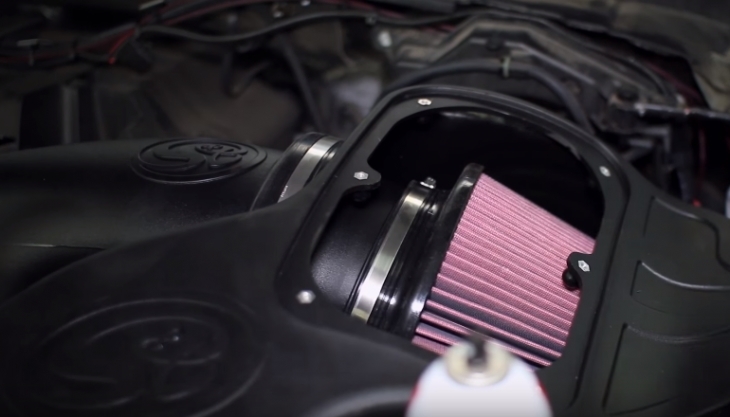 Air Filters for 6.7 Powerstroke – Buyer’s Guide! Just purchased a 2019 F150 with a 3.5 Ecobost and wanted a recommendation for an air filter replacement and possibly a tuning kit? Any thoughts.